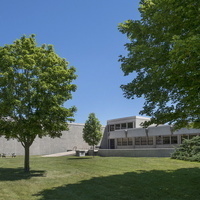 Home to the Department of Kinesiology and Physical Education (KNPE), Anderson Hall contains: a swimming pool, gyms, physical education labs, dance studios, classrooms and outdoor tennis courts. It was hot and being that I am not a young student I wish there would have been more direction as far a being introduced to other students in our field. It was kind of awkward.